Focus event triggers whenever control receives focus. 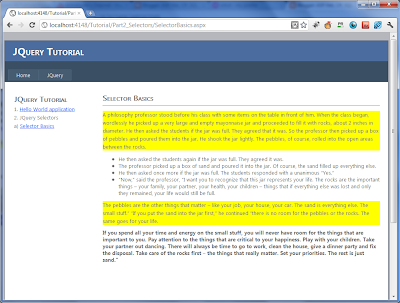 Example: change textbox background color on textbox focus. I have a 3 html input control, whose id is "txtInput1", "txtInput2" and "txtInput3" on receiving focus it should change its background color to Yellow, Red and Green. I have a 2 html input control, whose id is "txtInput1" and "txtInput2"
I will be discussing more JQuery examples in JQuery example series. I have a html textarea control, whose id is "txtInput" on selecting content of textarea, I will display alert. Change event will fire, when value of element is getting changed. 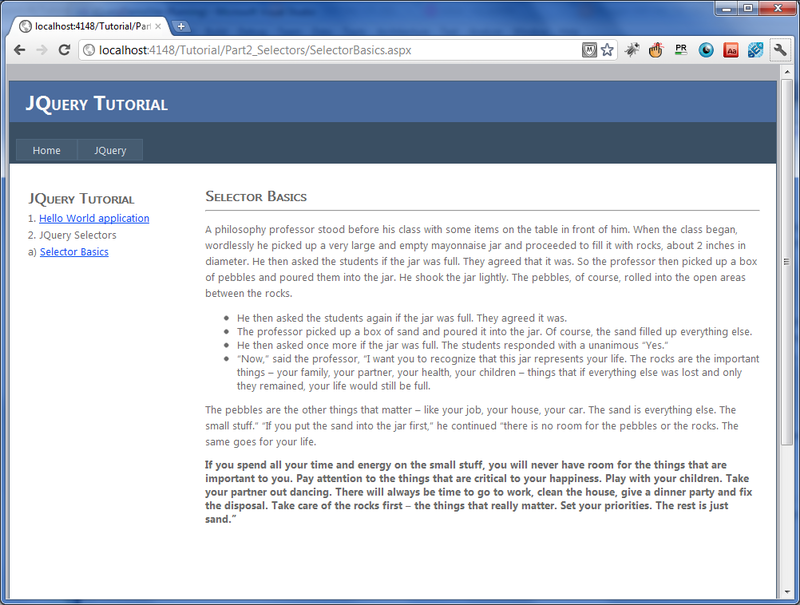 Example: If we try to change textbox value it should try to validate it. 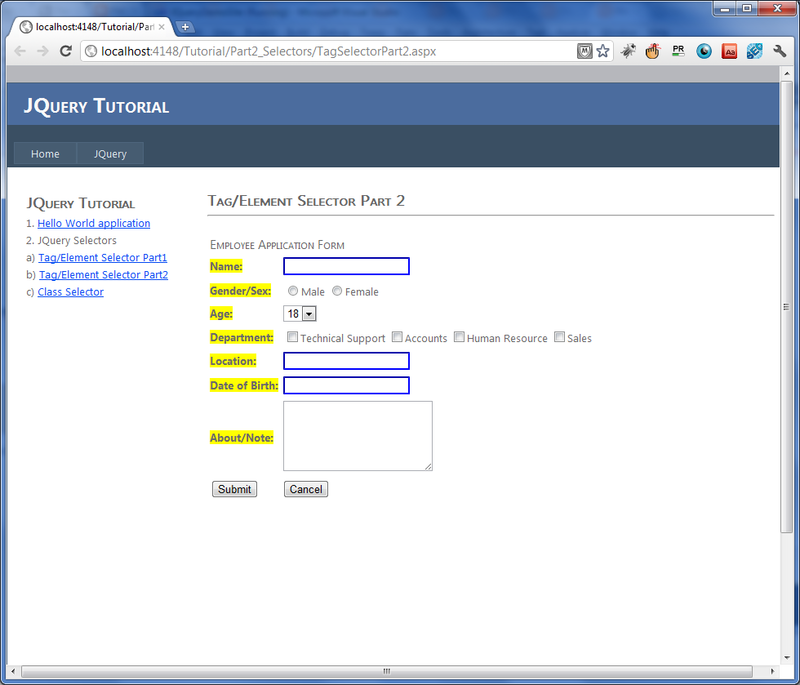 I have a html textbox control, whose id is "txtInput" on changing value of textbox content, I will display alert. In this article we will learn how JQuery keydown, Keypress and Keyup events work. This events are very similar and you will find very minor difference between them. To understand difference between Keydown, Keypress and Keyup event is sequence in which they triggers. I have a html input control, whose id is "txtInput" on writing any character inside textbox it should display alert. I have a html input control, whose id is "txtInput", when user releases key on keyboard this event will trigger and it should display alert. I have a simple html para, whose id is "MyPara" on double click of this paragraph it should display alert. Double click event is almost similar to click event, here instead of click we have used dblclick. 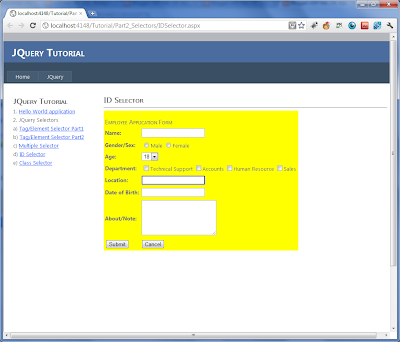 I have a simple html button control, whose id is "btnClickMe" on click of this button we will display alert. 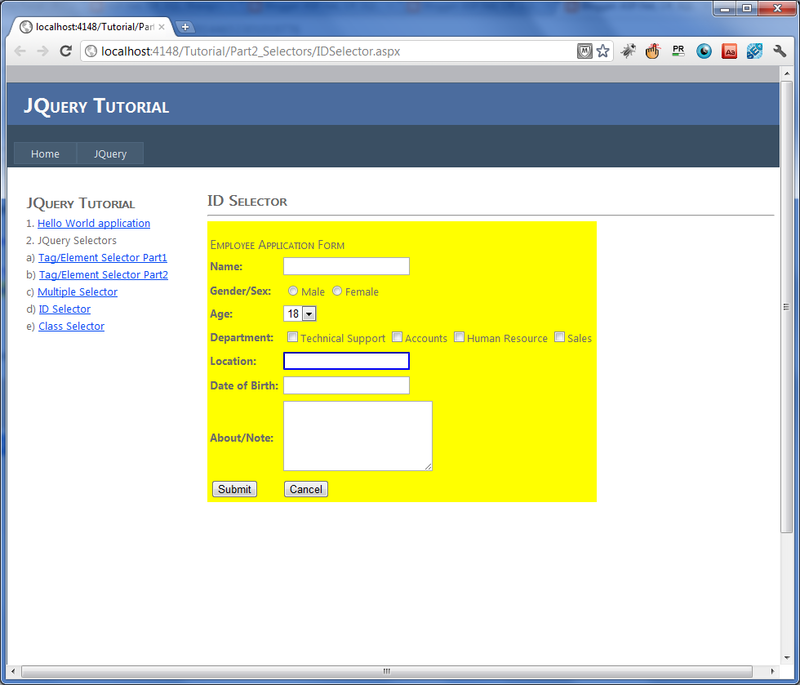 Step 1: Defining document.ready function. Whenever we are putting our JQuery code inside this code block means, we are instruction browser to execute JQuery code only when page is loaded and it is ready to execute JQuery code. Question: Can i put JQuery code directly without even putting it in document.ready function. Answer: Yes you can do, but in that case you need to be sure that your control is loaded before your JQuery code tries to access it, otherwise you may receive error. Step 2: Create a Alert function which can be called on button click event. Please note here #btnClickMe is button id on whose click event we are going to show alert. I have a asp.net button control, whose id is "btnClickMe" on click of this button we will display alert. With attribute selector in JQuery we can select element based on particular attribute. 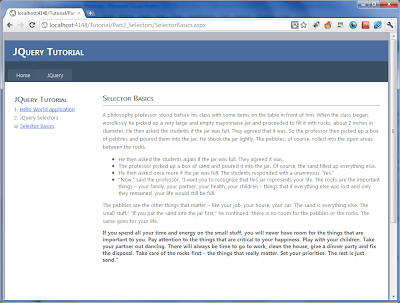 Lets understand attribute selector by example. Now let see, how attribute selector works in JQuery. Let change all the link appearing in blue to red. Let change all the link appearing in blue to red only for links which as rel="nofollow"
Let change all the link appearing in blue to red for one which are ending with .com. Let change all the link appearing in blue to red for one which contains word example. Note: Here we are selecting href attribute with word example, hence their are 3 links pointing to http://www.Syntax-Example.com, it has shown all three links in red color. Let change all the link appearing in blue to red for one which NOT contains rel="nofollow". JQuery selectors are used to select elements. In order to apply any effect or style change, it is necessary to select element, JQuery Selectors are used to select element in order to apply those changes. Lets understand through different examples. 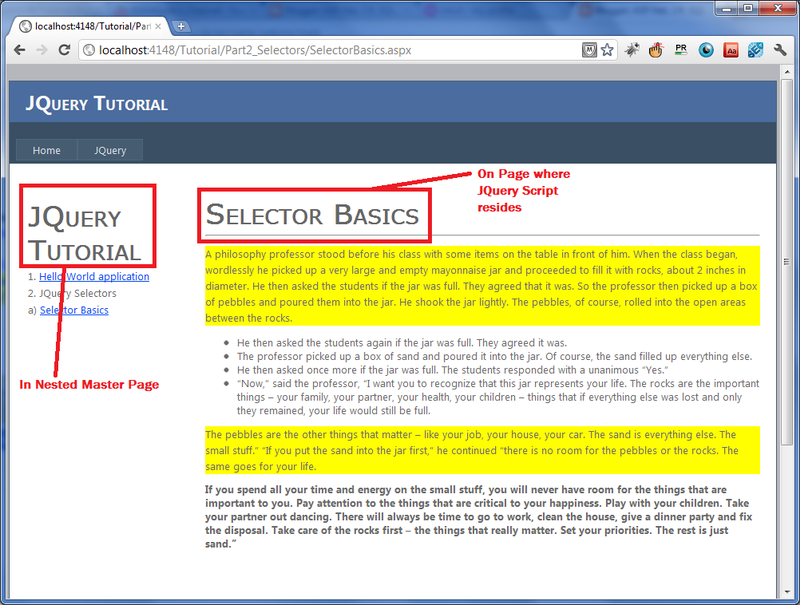 Ok, now we will start with basic examples of how selectors works in JQuery. 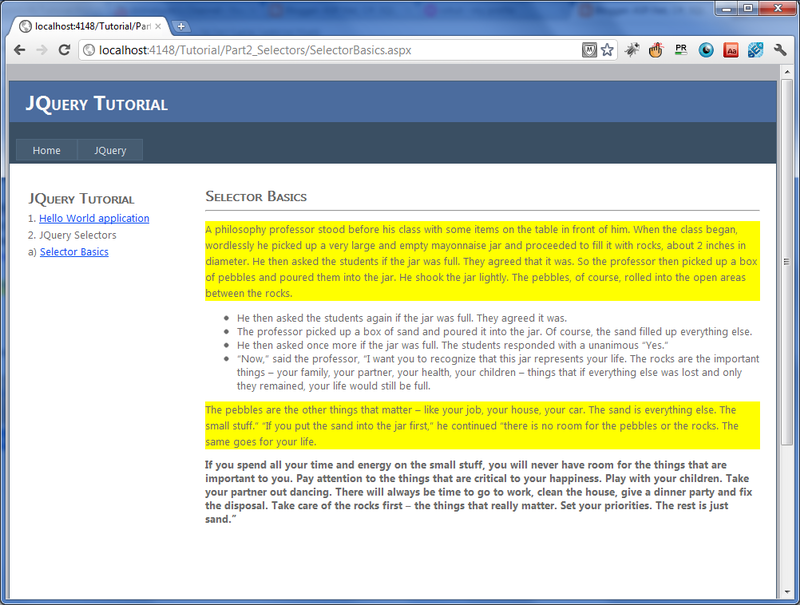 Example 1: Let select all paragraph tag in our page and change its text background to yellow color. 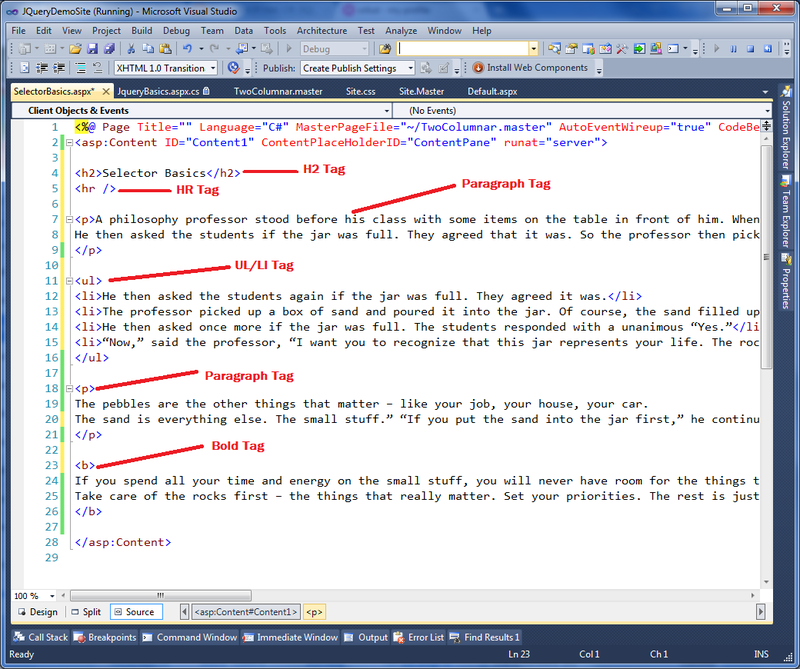 Example 2: Let select all "h2" tag (header tag on top) in our page and change its font family and size to verdana, 35px. It will change all h2 tag font. 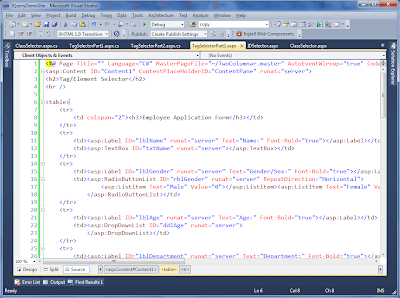 You can notice that one of h2 lies in Nested master page, while other is on page where JQuery selector tag is defined. 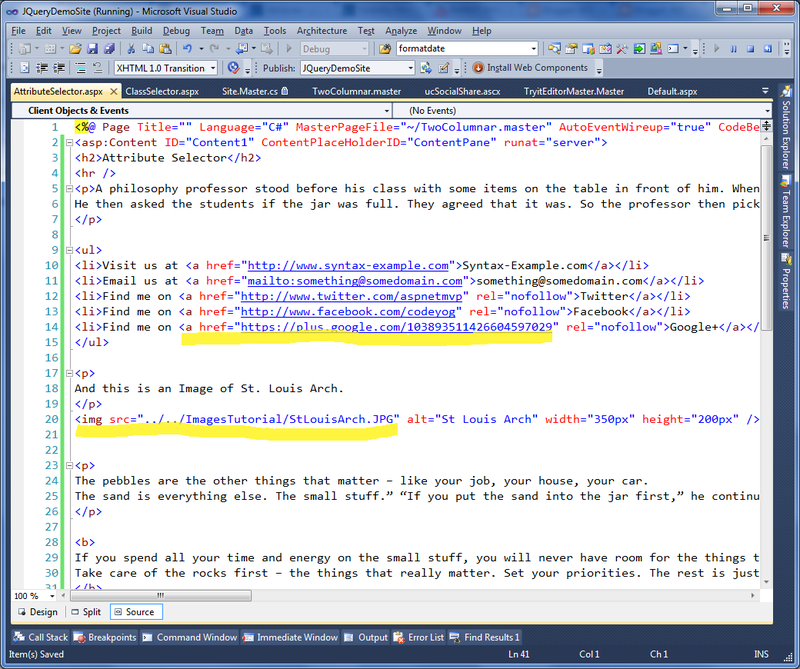 Well obvious questions might be running in your mind that i can do all this from CSS file, than what is the advantage? The only thing I can say at this point is hold on for a while and we will discuss how it is different and more beneficial. 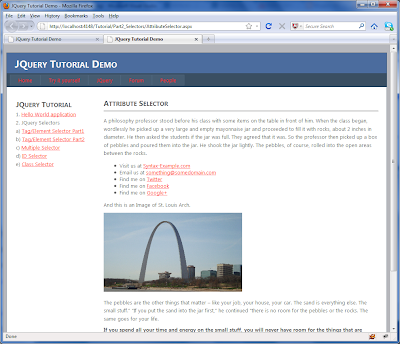 In next few blog post we will understand few more ways to use JQuery selectors. 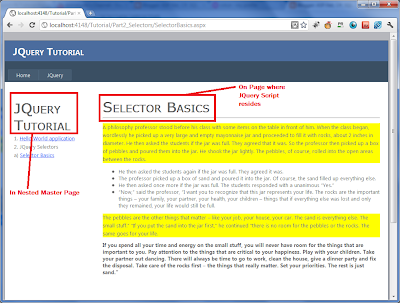 In this post we will understand more about ID Selector in JQuery. That is selecting a particular element based on his unique ID. Example 1: Lets give border color to blue to location textbox control on our asp.net web form. JQuery needs unique client id, in order to apply css effect. # - Is to tell we are applying css based on ID. <%=txtLocation.ClientID%> - is used to get client id of txtLocation control. It won't apply any border to txtLocation, because JQuery will not be able to find txtLocation to apply CSS. Example 2: Lets apply yellow background color to table containing all input controls. My table is not asp.net server control, i.e. it doesn't have runat="server"
Remember if control you are trying to select is not asp.net server control (i.e. not having runat="server"), then you will be able to select it directly.